Harvest when at least 3-4 flowers are open. However, bud cut flowers offer the significant advantage of being able to be transported with fewer problems assuming that an effective bud opening solution is used at receiver level. Can be left in the ground for up to three seasons for maximum production. Best quality flowers are harvested from 10-15 days after the beginning of harvest for a particular planting. Store at 36-38 F (three days or less), 32-34 F (more than three days, up to a week or more). One very unusual aspect of this species is that the flowers on the spike open from the top down, not from the bottom up as most spike type flowers. 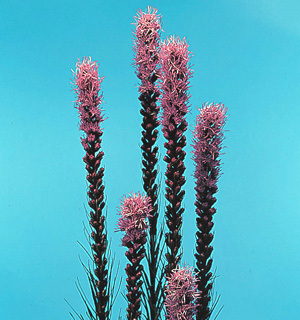 The specific epithet name spicata means with spikes, in reference to its flower form. Varieties available include ‘Floristan Purple’, ‘Floristan White’, ‘Gloriosa’ (purple), ‘September Glory’ (purple), and ‘White Spires’. Very difficult group as it has been complicated by the hybridization of some of the species. The consumer may have to change the vase solution frequently to prevent contamination if not using a proper flower food concentration. Also, consumers should choose stems with only the top third of flowers open. Suitable for drying- allow all flowers on spike to open first, strip leaves and hang upside down until dry. One of relatively few blue-colored spike flowers for use as cut flowers and garden plants. Resembling a feather duster, isn”t it hard to believe these unusual blooms are part of the Daisy family? The Compositae or aster family is vast, with over 20,000 species, and is also one of the most developed families. It was named Compositae because the flowers are actually a “composite” of many individual flowers into one head. Hence, when children pull one “petal” off at a time, saying “she/he loves me, loves me not”, they are actually removing a complete flower, not just a petal. Starman et al. (1995) rated this species (‘Floristan Violet’) as being a below average income producer.